Two miles below the surface of the ocean, researchers have discovered new microbes that "breathe" sulfate. "It was surprising to find new bugs, but when we go to warmer, relatively old and isolated fluids, we find a unique microbial community," said Alberto Robador, postdoctoral researcher at the USC Dornsife College of Letters, Arts and Sciences and lead author of a paper on the new findings published in Microbiology on Jan. 14. Microbes that breathe sulfate -- that is, gain energy by reacting sulfate with organic (carbon-containing) compounds -- are thought to be some of the oldest types of organisms on Earth. Other species of sulfate-breathing microbes can be found in marshes and hydrothermal vents. Microbes beneath the ocean's crust, however, are incredibly tricky to sample. Researchers from USC and the University of Hawaii took their samples from the Juan de Fuca Ridge (off the coast of Washington state), where previous teams had placed underwater laboratories, drilled into the ocean floor. 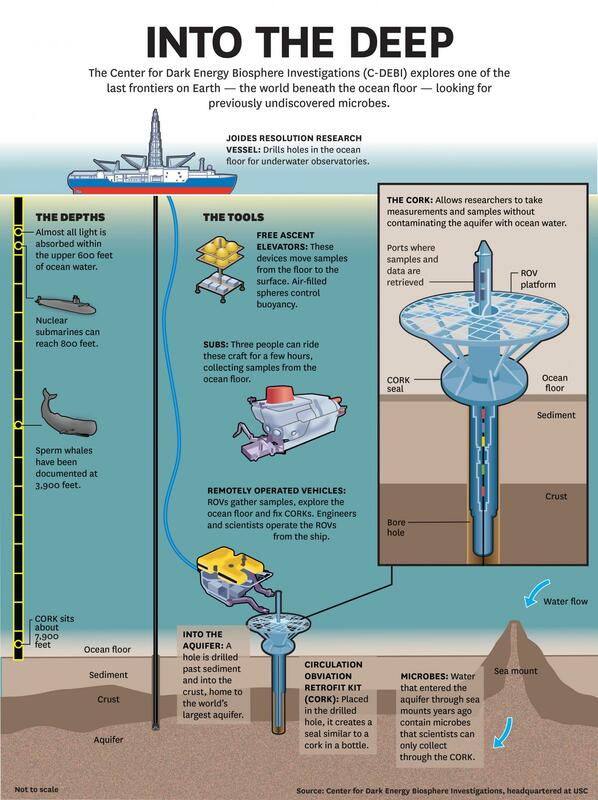 To place the labs, they lowered a drill through two miles of ocean and bored through several hundred feet of ocean sediment and into the rock where the aquifer flows. "Trying to take a sample of aquifer water without contaminating it with regular ocean water presented a huge challenge," said Jan Amend, professor at USC Dornsife and director of the Center for Dark Energy Biosphere Investigations (C-DEBI), which helped fund the research. To solve this problem, C-DEBI created Circulation Obviation Retrofit Kit (CORK) observatories. The moniker was basically dreamed up to fit the term "CORK" because these devices create a seal at the seafloor, like a cork in a bottle, allowing scientists to deploy instruments and sampling devices down a borehole while keeping ocean water out. Samples were then shuttled to the surface by remote-controlled undersea vehicles or "elevators" -- balloons that drop ballast and float samples gently up to the waiting scientists. "This is the first direct account of microbial activity in these type of environments," Robador said, "and shows the potential of these organisms to respire organic carbon." The research was funded by the National Science Foundation (C-DEBI award OCE0939564, MCB0604014, 1207880 and 1207874) and the NASA Astrobiology Institute.